The Newest Rant: Reviews of "Thanos Wins," and, "The People Vs. The Justice League," Thanks to my Local Libraries! Reviews of "Thanos Wins," and, "The People Vs. The Justice League," Thanks to my Local Libraries! I have written before about my fondness for the local libraries in our area. Since both have been renovated both the super-big Daniel Boone branch as well as the freshly-redone Grand Glaize location are spectacular. Saint Louis County seriously has some stellar libraries (and the City of Saint Louis itself has some superb spots too). I was able to check-out two trade paperbacks from the wonderful library system lately and thought I'd review them. I wrote about this comic when it was first coming-out and getting a whole lot of buzz thanks to being expertly penned by Donny Cates and fantastically illustrated by Geoff Shaw. It also featured the introduction of the fantastically bizarre Cosmic Ghost Rider--which resulted in a lot of demand for the comic--with the character being a version of Frank Castle (the Punisher) from the future that also happened to be an intergalactic spirit of vengeance. 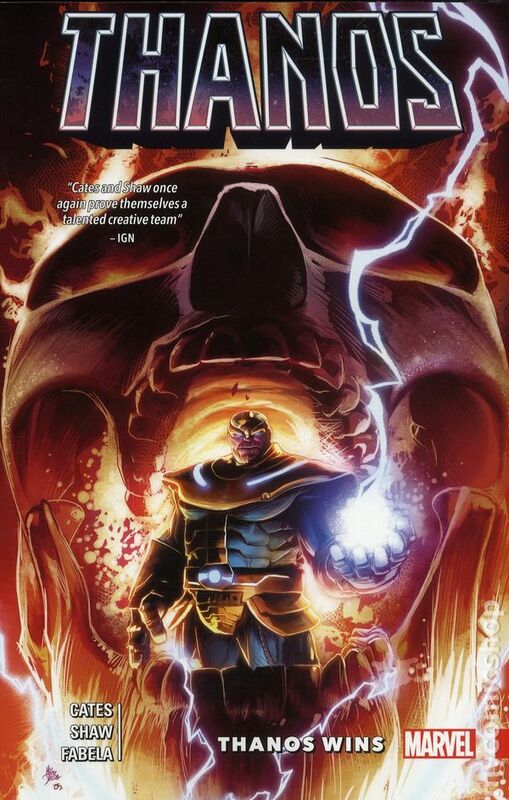 "Thanos Wins," basically was Cates finishing the, "Thanos," series that had started-out written by Jeff Lemire and upon the conclusion of this series Thanos started popping-up in other Marvel books, with the Cosmic Ghost Rider getting his own mini-series and about to appear in other books too (a new, "Guardians of the Galaxy," is the latest buzz). It's a fun little arc, following Thanos as he is ripped to the future only to find that he in fact, "Won," and destroyed basically all life in the Universe only to realize he was stuck alive at the end of the world unable to be with his true love, Death. This future-Thanos has the old one come to help him fight off the few remaining threats in the Universe and we get a bunch of background on how Thanos managed to kill so much of the cosmos (along with a ton of back-story for the Cosmic Ghost Rider). 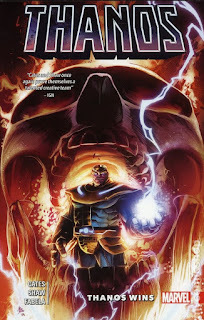 I liked, "Thanos Wins," thanks to its mixture of dark humor and fantastic artwork, but wouldn't say it does anything especially memorable outside of being a cool, "Hey, let's do some time-travel," yarn and introducing what appears to be the, "New," fan-favorite character of a space-Punisher-Ghost Rider, which admittedly is a wildly fun idea. 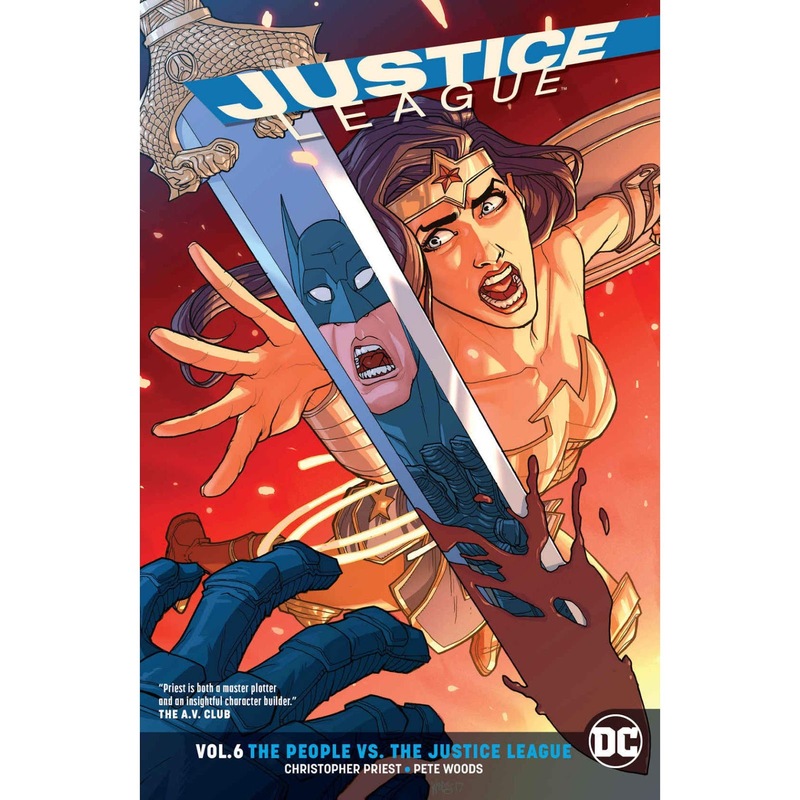 "Justice League Volume 6: The People Vs. The Justice League"
I read reviews of how before its recent re-launch a writer whose work I always talk about adoring--Christopher Priest--took over the, "Justice League," comic. 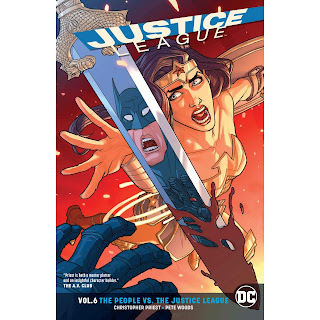 I also read that despite this being, "Volume 6," in the story you don't need to know much as it is a story wholly unto itself that focuses on the Justice League as they face the challenge of public opinion turning against them (as it sometimes does) whilst also combating a deranged, "Fan," who has access to a lot of their tech. Priest is of course an amazing writer so watching as he lays-out a clever plot full of mysteries, has all the characters engage in fun dialogue, and otherwise make some damn fine comics as always is just delightful. Priest writes the characters in a way that just feels authentic. Batman is a genius but also has a human body that is running itself ragged, Superman is a wonderful idealist, but sometimes thinking the best of people can be its own flaw, Cyborg is skilled and powerful enough to run the team yet has his own fears of that much responsibility, and Wonder Woman is strong and regal, yet also sees how the team has numerous flaws. It goes on like that, with other team members such as Aquaman and two separate Green Lanterns (Simon Baz and Jessica Cruz) dealing with their own complications in regards to the team as well. There are heroes who know they do more good as a team than separate, but also are aware being a team brings with it many complications. It's a comic by Christopher Priest, so you basically can be guaranteed it is outstanding.There is one more volume that finished-out this most recent run, "Justice League," that I for sure need to seek-out so I can read the conclusion of Priest's run on this book. Hopefully my library already has, "Volume 7: Justice Lost," or else I'll be sure to request it! Thanks Again to My Local Libraries! An exterior view of the Daniel Boone branch Clarkson and I frequent. I just want to say thanks again to my local libraries of Grand Glaize and Daniel Boone where I was able to acquire these great reads. Whether I'm at the library to get books for our family, for all the fun story-time and play-times Clarkson enjoys, or any other reason, going to the library is always a treat.